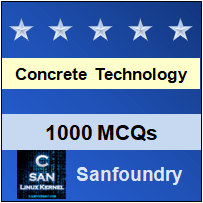 This set of Concrete Technology Multiple Choice Questions & Answers (MCQs) focuses on “Source of Aggregates”. 1. Natural aggregates comes in which category? Explanation: The word natural itself says that it comes from nature which comes in origin. And there are 2 types of aggregates in based on origin i.e. natural and artificial aggregates. 2. Generally rounded aggregates are the example of natural aggregates. Is this statement true or false? Explanation: Natural aggregate are those from the river beds, river sand and ex-mines. They are generally normally rounded in shape and have smooth surface texture. 3. What are artificial aggregates? Explanation: Artificial aggregate are those obtained by mechanically crushing rocks, boulders, or cobbles. Normally angular in shape and have rough surface texture. Explanation: Bulk density is depends on the properties of the aggregates not of the container. Size, shape, Specific gravity, grading are the properties of aggregates. Explanation: An aggregate is said to be flaky if its least dimension is less than 3/5th of mean dimension. Explanation: For making light weight masonry blocks (to improved their thermal and insulating properties and nailing characteristic). Explanation: Most of the people are used Ennore sand for its good strength and other properties. Explanation: 40 mm for massive works like dams, retaining walls, etc. 20 mm for Reinforced member. 10 mm for floors. 9. Generally angular aggregates are the example of natural aggregates. Is this statement true or false? Explanation: Artificial aggregates obtained by mechanically crushing rocks, boulders, or cobbles. Normally angular in shape and have rough surface texture. Explanation: The unit weight of heavy weight concrete varies from 2400kg/m3 with sp.gr range from 4.0to4.6 (mineral ores and barite).